Description: A former boxer and failing robot-boxing promoter is about to lose everything when he suddenly has to spend the summer with his estranged 11-year old son after the death of his mother. Putting a new spin on a tried and true formula, Real Steel combines 3 well-known plot-types with some of the best CGI special effects in years. It is both an Underdog movie, with the newcomer reaching the big leagues, a family drama, with our two main characters trying to reconnect and a movie about companionship, with the boy and his robot angle, it's likeness seen before in movies such as E.T, The Iron Giant and even to some extent Studio Ghibli's Ponyo. Set in the near future of the 2020's, human boxers has long since been outsourced in favor of the potential for carnage in having machines fight each other. There is drama here, not that the movie ever gets particularly dark, mind you. It was definitely made with a kid and teenage demographic in mind but the roots of the drama of the story isn't exactly roses and daffodils. The drama of course, stems from the relationship between our two main characters. Hugh Jackman plays the failing boxing promoter Charlie Kenton that gets by in life by running from loan sharks and being overzealous, apparently repeating the same mistakes constantly as his downward spiral just continues. This is interrupted when he is contacted to sign over the rights to a son he barely remembers he had, his ex has just passed away and he now has to deal with the responsibility of trying to connect with his 11-year old son, a boy in whose life he's never played even a minor part. As far as child actors go, Dakota Goyo manages to get the job done without making it painfully obvious that he's not had to carry a movie to this extent before, having mostly appeared in minor and supporting roles to that point. This movie was not made for an adult audience, and thankfully so as these types of niche movies tend to rely far too much on the nature of so-called nerd demographic to try and unnecessarily "dignify" their choice of movie with it being as dark and gritty as possible, almost childishly so as a result. The movie at heart is a fun little father-son adventure, set in a robot boxing universe. But while the main plot is simple, the execution is stellar and the audiences curiosity for the universe surrounding our main characters will make for a fun, if simple experience. There is nothing deep here, and you should not expect to be enthralled by a dramatic moment or a message. What you should expect, is fun to-the-point robot fighting action with some of the best CGI effects in the genre. Robots really take the center stage in this movie and some of the designs of these things are pretty imaginative, and while not as great a movie I would wager that they're better than those of more recent robot movie Pacific Rim. I should elaborate, while the design of our main robot is pretty basic (basically a big metal person) a few of the designs of the minor robots are pretty stellar and I highly support the decision to make every robot almost have it's own little signature, minor things like having the robot with a cowboy design raise it fists in a rhythm that would suggest shooting two revolvers into the air in true western fashion are just neat little touches to brighten up the atmosphere of the movie. Thankfully, the action scenes are also shot in a manner to try and show off the designs of the characters, meaning that unlike movies like Transformers you will never have trouble recognizing who's who in the ring. Honestly, at some points I felt that the robots really were there if only for a brief moment. 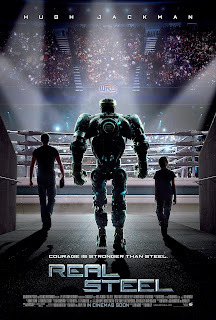 Bringing the underdog sports movie into the new millenia, Real Steel is the kind of movie you would expect to have been made in the eighties and nineties - I could probably have found myself playing with toys of these characters alongside those of Ghostbusters figures. As it is though, I consider it some of the best live action children's entertainment in recent years. I recommend it to kids and childish adults everywhere.